And so we are here, at the end of the summer on the northern hemisphere. This naturally will not stop the production within the street art field – if anything, all they have to do is migrate south. Of course, September will still be warm enough, and as we look forward to Street Update #170 in 30 days, we must first take a look at the month behind us and the splendid new murals which are now up there. As always, make sure you follow us on Instagram for even more of street art. Painted on a 12-story Soviet apartment building in Minsk, on the occasion of Signal festival, Boy with Bird Sculpture reimagines the works of three different Belarus artists: Yazep Drazdovich, Alexander Kischenko and Pavel Voinitski. 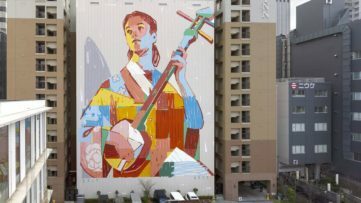 Of course, to mix them up there was the talented Fintan Magee. The artist calls this mural “a monument of Belarus Futurism”. 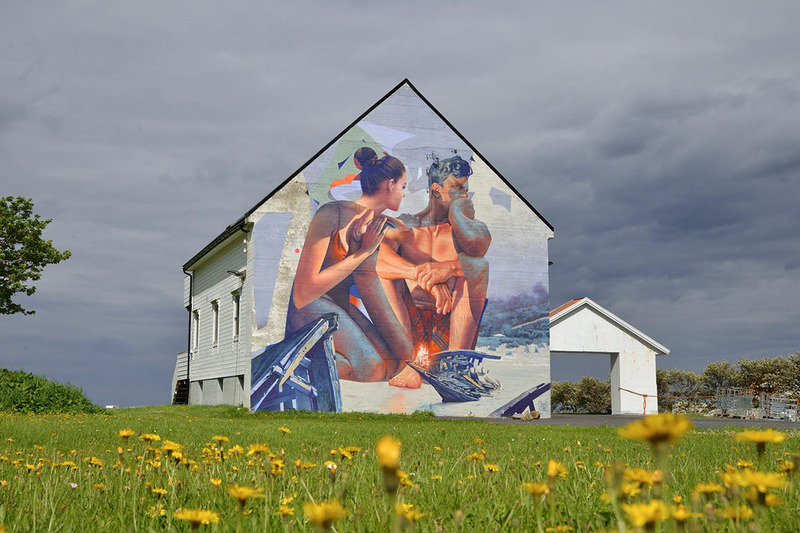 No Matter the Wreckage is one of the latest murals painted by the TelmoMiel duo, this time in the Norwegian town of Refvik. Their painting salutes the rich history of this place, its wildfires, storms, Nazi invasions and shipwrecks, traces of which can still be found on site. Having taken place in August 2018, The Calle Libre Festival in Vienna celebrated its 6th edition. 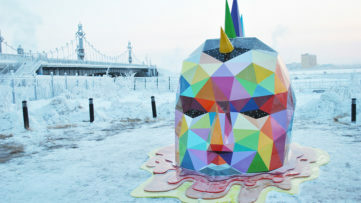 Coming together for the occasion were many well-known street artists, among which there were Kobra, Lost Optics, Jacoba Niepoort, Artez, Saddo, Zesar Bahamonte, Medianeras and Edward von Longus. Enjoy this slideshow of their works! I can safely say that this year’s Wide Open Walls festival held in Sacramento, CA was one of the most inspiring ones ever. 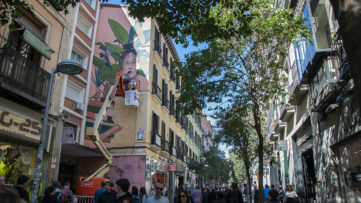 Between August 9 and 19, artists from all around the globe provided their contribution to the city walls. Among them was mur0ne, whose colorful mural masterfully incorporates the space of the angular wall. 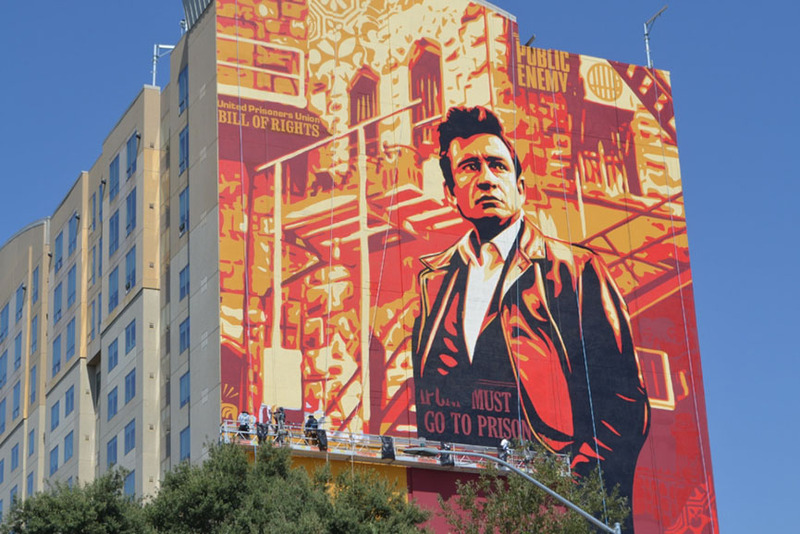 Speaking of Wide Open Walls, Shepard Fairey was also there, and now there is also his 150-story mural of Johnny Cash. This is the artist’s largest work in the state and it commemorates the 50th anniversary of Cash’s Live at Folson Prison album. ”I hope that this art will ignite a conversation around the need for incarceration reform,” said Fairey. The third highlight piece from Wide Open Walls this year is the one made by PixelPancho. The Italian artist seems to have created a version of Princess Leia in his signature animal-robot hybrid style. Needless to say – we love it! MadC was in for a big celebration in August, as she finished her 1000th, and her biggest ever, mural! The German artist spent 13 days painting the 1000-square-meters wall using 1093 Molotow cans and 30 gallons of acrylic paint. The piece was created for the Columbia College Chicago’s Wabash Arts Corridor and can be found in the heart of the city! Flirting is the third mural that WD Wild Drawing painted at Ura Vajgurore in Albania. Another great example of excellent space use, the mural sees a couple peeking at each other from two sides of the building, accompanied by the artist’s trademark use of illusion. Last but not least is the latest work by Italian artist Eron, painted in Cevo, Italy. Soul of the Wall is painted on the old building of a former school and is dedicated to the history of the village and the destructive fire that was deliberately set to destroy it in 1944. The piece was painted for Wall in Art 2018. 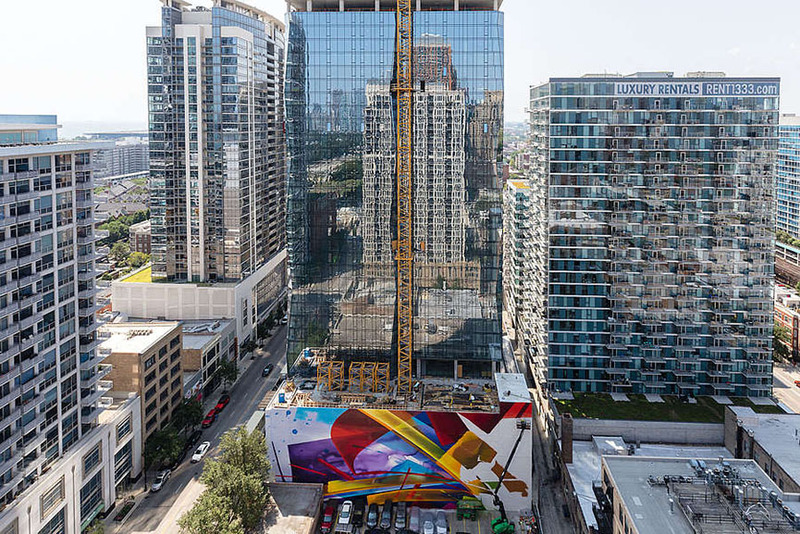 Featured images: Shepard Fairey Johnny Cash Mural, via jadeannahughes.com; MadC in Chicago, via Molotow; Telmo Miel in Norway, via urbanitewebzine.com.